The Department of Electrical and Computer Engineering at Grove City College prepares students to excel in careers in research, design and development, management, sales, field service, manufacturing, and education as well as top graduate and professional programs. The department offers a Bachelor of Science degree in electrical engineering, and the electrical engineering program is accredited by the Engineering Accreditation Commission of ABET. Students in the Department of Electrical and Computer Engineering receive specialized instruction in electric circuits, electronics, electrical machines and power distribution, and digital systems from full-time faculty members. Advanced topics include communication systems, computer systems, and control systems. Through hands on projects and coursework, students learn to define and solve electrical engineering problems while using first-rate facilities and equipment. 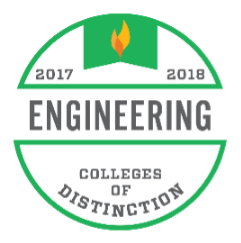 In 2017, U.S. News & World Report recognized the College as having one of the "Best Undergraduate Engineering Programs" at schools where a doctorate degree is not offered. Grove City College ranked 55th nationally. The Bachelor of Science degree program in Electrical Engineering at Grove City College is accredited by the Engineering Accreditation Commission of ABET. Students are expected to possess specific student outcomes upon graduation and to achieve certain program educational objectives within a few years after graduation.